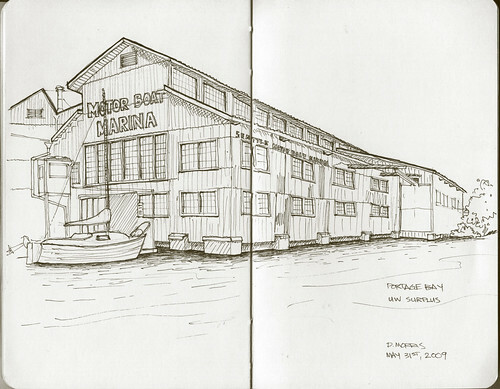 Urban Sketchers Seattle: "Motor Boat Marina"
I sketched this from a dock that I paddled up to this morning. This building is used as a parking garage by the UW Surplus Department. The surplus store is out of the frame to the left. That building is wrapped and being painted. I was chatting with some of the painters, who had a net and were pulling dead fish out of the water ( the same water I had my feet in. ) The fish are about 3 inches long and have sharp dorsal spines. Not sure what they are, but I see them often when I am paddling around in Portage Bay and the other side of the Montlake Cut. They were joking about eating them. this is a great view Dave, awesome perspective, so you were kayaking? you'll have to forgive my ignorance of water sports! I envy you this adventure! Wonderful drawing, great narrative, terrific sneaking up on it all by water! I was out in my kayak. I put in over by the UW Stadium at the boathouse. I was a little bit concerned about getting the book wet. I had it in a dry bag when I was paddling. I tried to sketch from the kayak, but it was not easy. There are a number of interesting places to sketch on the water if you can keep steady. Are any of you interested in sketching at the Lake City Farmers Market this Thursday? I can take some time off in the afternoon. I believe it goes from 1 to 7. I would love to check out this market if I can escape my loony schedule! I'll look into it as well. I will be up there around 4. The LC Farmers Market is at 125th and 28th behind the library. Hope to see you guys. I made a mistake and posted my comment to you under my own picture. So, again..thanks for your comment about my drawing..and, I enjoy your drawing too. I can't make the drawing session on Thursday, but another day, yes! It will be great to be spontaneous about getting together to draw! I will hope to come by the market late Thursday afternoon and look for folks sketching! Great idea!